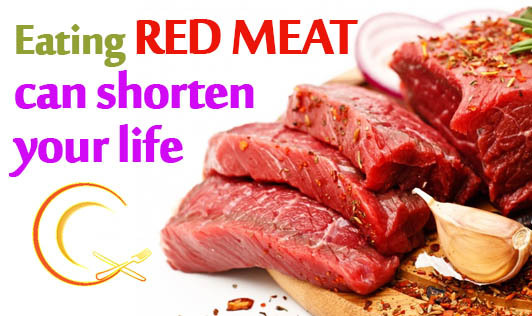 When researchers studied half a million people for 10 years to find out what impact eating red meat had on a person's lifespan, they learned that the more red meat a person ate, the higher the risk of an early death. In the study, people who ate the most red meat averaged about 150 grams per day. People with a low-meat intake averaged less than 25 grams of red meat per day. Men who ate the most red meat were 31% more likely to die early than were men who ate the least amount of red meat. Alzheimer's, stomach ulcers, and an array of other conditions. There are remarkable health advantages from eating less red meat. The researchers estimated that 1 out of every 10 deaths in men could have been prevented if the men had eaten less red meat. In women, researchers estimated that 1 out of 5 deaths could have been prevented if red meat intake was reduced to low levels. In the study, eating poultry and fish resulted in lower mortality levels, as did vegetarian diets. The American Cancer Society nutrition guidelines recommend choosing fish, poultry, or beans instead of beef, pork, and lamb; and also baking, broiling or poaching meat rather than frying or charbroiling it. Source: Archives of Internal Medicine. March 2009.